Hi there, I re-syncronized Opera and I've lost all my passwords, how can I recover them? thank you all. What do you mean by 're-syncronized'? Did you reset your synced data? Were your passwords previously synced? Yes, I couldn't remember the passphrase, I reseted the data, all bookmarks and quick access are right, but passwords were reset to zero... I check the sync.opera.com, I can see the trouble with passwords there. 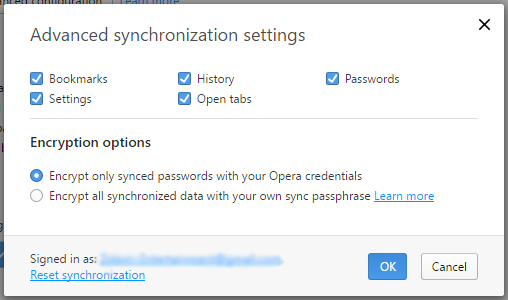 If passwords were previously synced, then they should be at sync.opera.com as long as Bookmarks and SpeedDial "quick access", (despite Passphrase reset), but "sync passwords" is an option that must be set manually. Passwords sync is unchecked by default. Did you see this window and checked Passwords option!? Yes, I saw it and it was marked, now too. Reset synced data only remove it from sync servers, keeping all your data locally. So, did you remove your data locally too? But reset passphrase and reset sync data are the same? If reset passphrase does not involve to reset sync data, then Passwords should be there. Yep, you reset passphrase by resetting synced data.